Last weekend, we were invited to a Jurassic-themed Exbihition, Dinosaur Alive KL, which was held at Malaysia Tourism Center (MaTIC) it is open every day from 10am to 10pm until January 2018. Miya was extremely excited when I told her she was visiting dinosaur, she has only seen them in books and toys r us but seeing the real thing that moves really excites her, come to think of it mummy is also as excited as she is because I have always been curious about these mysterious monsters. The moment we arrived, she immediately ran over toward the animatronic dinosaur that was right outside the hall and insists we took a picture of her. She was really happy to see a dino that moves and roar! 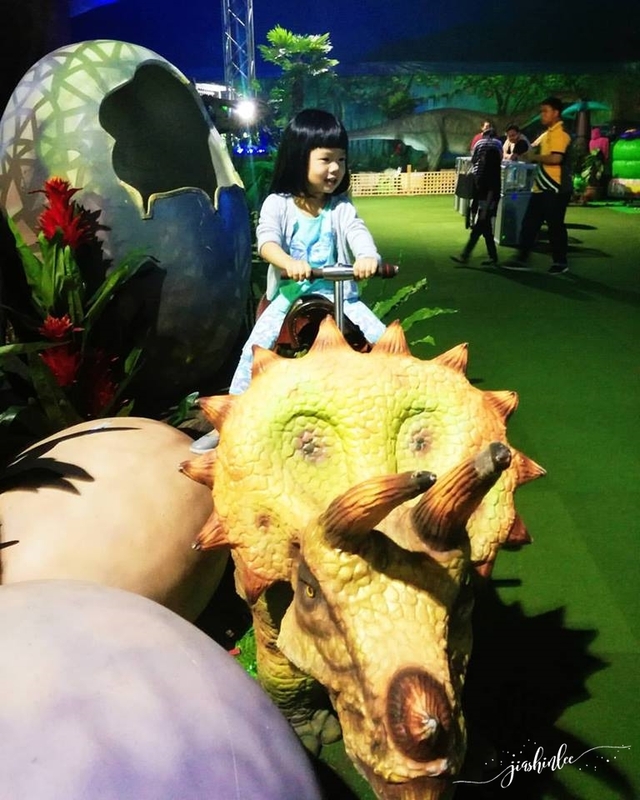 The exhibition is suitable for kids of all ages, there are plenty of activities available such as fossil dig zone, dinosaur sand crafting area, dinosaur bone assembly, jumping castle and much more. The exhibition showcased more than 40 life-sized animatronic dinosaurs, as you step in the hall you will notice the monstrous Tyrannosaurus rex. The scale and authenticity of these terrifying creatures will amaze you, as they move and roar with thrilling lifelike accuracy. For those who love dinosaurs, there will be plenty of surprises in store for you to learn more about these mysterious monsters. There were also three jumping castles available for kids to use up their energy, it kept Miya entertained for hours, sliding, bouncing and jumping. Carnival games were also placed in the hall, for a fee of RM10 per round you will get a chance to win yourself a prize. 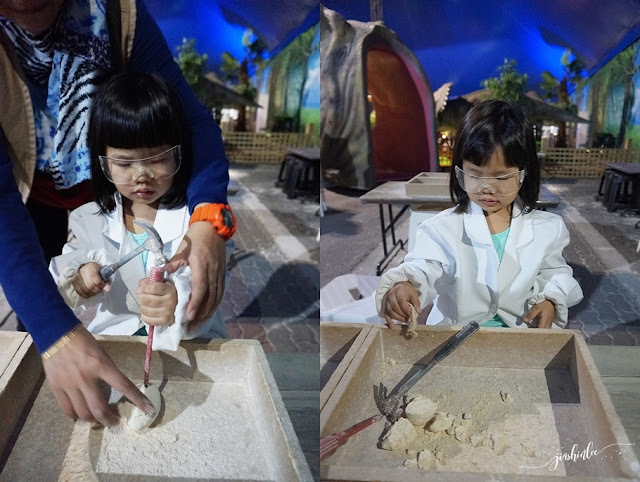 Miya also took her time to enjoy the fossil dig zone, it was RM10 per fossil, she has a great time carefully excavating the plaster egg and got herself a little fossil at the end of the session. The dinosaurs look so real especially they roaring. Having fun touch and snap pic of the dinosaurs. When they roaring make my nephew and niece scared hahhaha...this is a great place for kids so they learn more about history..
Wah so nice. My kids mesti suka. Looks fun. I'm sure my children will love to go to this place too. To be near to the dinosaur. Great activity for kids to try out the fossil excavating. They made it in exact scale? Wow! Wah. Boleh juga datang sini tengok dinasor. Banyak juga aktiviti untuk kanak-kanak jadi diaorang tak bosan. Nice place for kids. Anak-anak mesti suka dapat jumpa dinasor. Wow nice experience in Dinasour Live KL. Its also for adult not for kids to have this moment and experience. so good time with family there. Dinosauar are kids favourite too! this place I no go before. i wish my bot was big enough for this! it looks like so much fun! Wah..gonna list this place as "must visit" this year end. Oh. My son is an absolute fan of Dinosaurs and would have absolutely loved this event! Nice pics! My children would love to visit this place. A good place to take photos with dinosaurs. This is such an awesome place to visit with friends and family. I loved your pictures and the dinosaur looks real. I will definitely add this to my bucket list.